When you have finished designing and setting your project, you are ready to download it to your operating device. 1. Select the project you wish to download to the device from the Projects folder in the Project Window – this will render the Upload/Download icons in the toolbar. 2. Click on the Download to Devices button to load the selected project to the device. You can also right-click on the project from the list and select Download from the menu. 3. 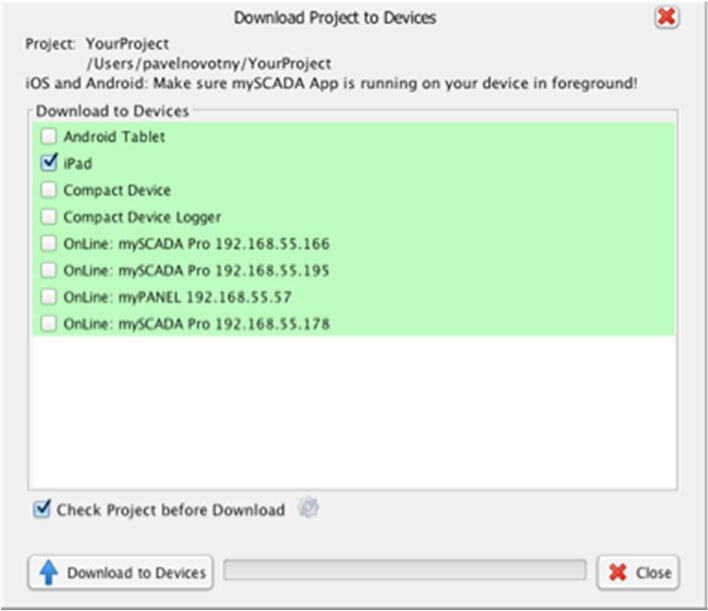 In the following dialog window, you will see the list of all defined devices and all available On-line devices you can load your project into (except mySCADA Box and myLOGGER – these need a serial number for communication). Note: You can download your project to multiple devices at once. To do that, check multiple devices. Warning: when loading a new project to your device all existing projects loaded on the device will be overwritten! Thus, be sure to back-up all important project information from the device before loading a new project to it.